After a couple times of trial and error, I have finally come up with this recipe. It is great for snacking, contains whole wheat, olive oil and toasted sesame seeds! A piece of equipment you might want to consider getting if you don’t already have is the pasta maker, it made my life so much easier. Here I rolled them out so thin that the crispiness is more like chips more than crackers. So why have greasy chips when you can have these thin and crispy crackers? 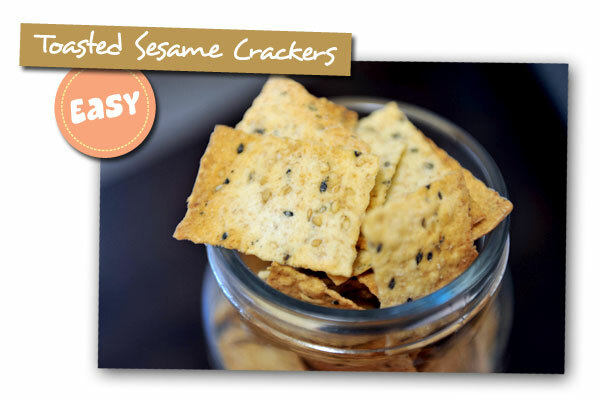 * I used Japanese sesame seeds – they are very flavourful and are already toasted which is very convenient. *If you don't have a pastry cutter, just cut the dough with a knife. In this photo I cut them before brushing the oil but it actually easier to brush the oil and then cut. In a medium bowl, mix all dry ingredients. Add water and olive oil. Mix with a rubber spatula until the dough starts to form. If the dough is too dry, add a bit more water. Turn the dough on a counter and knead until it becomes not sticky on your hands. Wrap the dough with plastic wrap and let it rest in the fridge for at least 30 minutes. After resting, divide the dough into four pieces so you can work them through the pasta maker individually. * Preheat oven to 375°F/190°C. Work the well-floured dough from the thickest setting and gradually to the thinner setting (I rolled these to the setting “7” with the thinnest at “9”). * If you don’t have a pasta maker, roll the dough with a rolling pin into a very thin sheet. Cut the dough sheets so it fits on the cookie sheet, place on the cookie sheet lined with parchment paper and brush with more olive oil and sprinkle with sea salt. 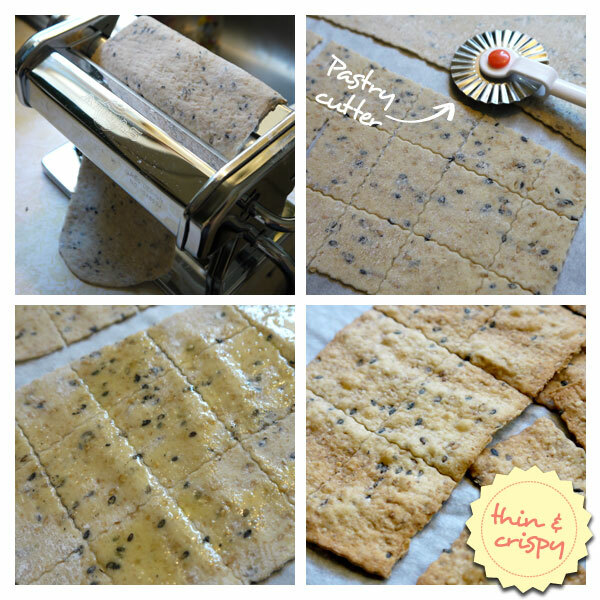 Cut the dough sheets into small size crackers and bake for 12-14 minutes or until golden brown (keep an eye on them because they can burn easily). Let cool and store in an air tight container. I usually don’t store them for a long time because they are always gone after a couple of days. They taste great with hummus too! yum! I gotta make these!